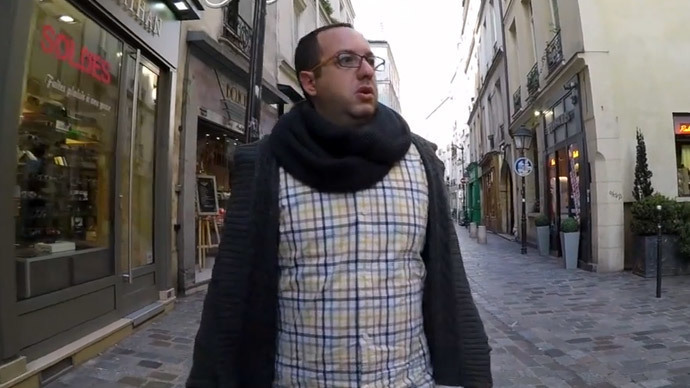 As anti-Semitism continues to rise in Europe, one Jewish journalist decided to replicate an experiment with his own twist: to walk around Paris wearing a kippah. He incurred insults, threats and was even spat at by one passer-by. It appears that a month on since the Paris attacks, the situation is only getting worse, especially for Europe’s largest Jewish community, which faces increasing anti-Semitism, mixed blind prejudice from both young and old. That’s what Zvika Klein learned when he took an intimidating 10-hour walk across all areas of Paris and filmed the results. He told RT of the experience. “It was frightening, it wasn’t something that I’m used to, having people spit at me or curse me on the street. Actually, it was nerve-racking, especially after [the Paris attacks]… but we wanted to see what it was like to be a Jew in Paris these days,” Klein says after getting called out on the street by people telling him to “go f**ck [himself],” interspersed with the cries of “Viva Palestine” and outright threats. The calls came from people of all ages, but mostly men aged 16 to 40. Although the person he remembers spitting at him was a woman. The problem is far-reaching – even children had something to say. Klein started paying increasing attention to Jewish coverage in France after the Toulouse incident in 2012, when Mohamed Merah, who trained with Al-Qaeda fighters in Afghanistan, had returned to France to wreak havoc, killing seven people before being shot dead by police in a subsequent siege. Klein was fascinated by the New York experiment of six months ago, when a woman had decided to gauge the city’s sexism by simply taking a 10-hour stroll through the city and filming the results. The January 9 attack on a kosher store in Paris prompted Klein and his colleagues to do the same type of filming about a Jew in Paris. Immediately, Klein noticed that the relative calm of the tourist areas was replaced with more menacing stares and remarks the further the crew was from those places. Klein notes how the anti-Semitism is a higher risk in France, due to both Jews and Muslims numbering hundreds of thousands there. “I think it’s one thing to try and want to be a democracy, but then again, if there are certain people or religions turning this democracy into a warzone, it has to be dealt with… it’s a difficult decision for a democracy, but Europe is definitely in a difficult place right now,” he adds in reference to religious extremism on the rise in France. The experiment also follows the sudden realization by Jewish communities across Europe that Europe is becoming an unsafe place for Jews. There has been talk of a mass ‘exodus’ of Jews back to Israel, with even Prime Minister Benjamin Netanyahu waiting back home with open arms. Klein believes that as many as 100,000 Jews could be set to leave Europe in the coming years. This has been a hotly debated issue in Israel as well, namely how to accommodate such large numbers. Although “Israel has many security issues… so does Europe,” and Klein believes it’s safer for a Jew to move ‘home’ nowadays.